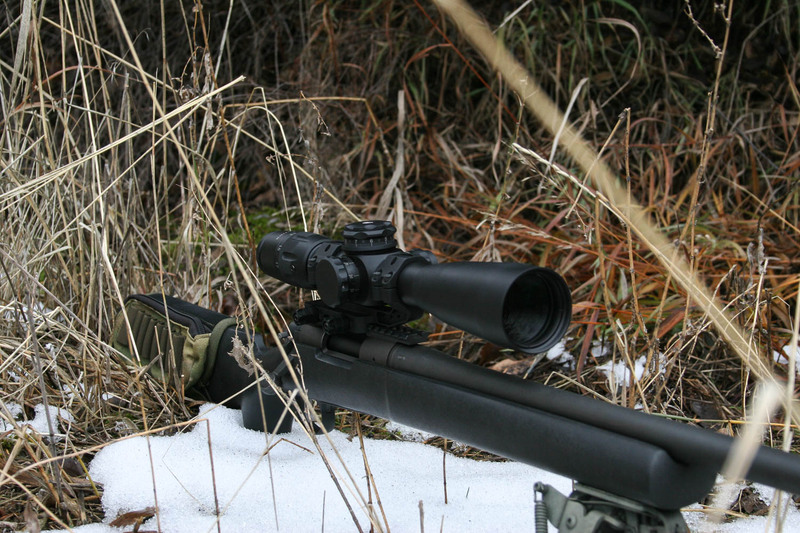 US Optics has been around for a long time in the tactical scope scene. They have been known as a boutique custom scope builder, a US based optics manufacturer, and they have even been involved in the service and construction of the legendary Unertl USMC 10x scope. This boutique shop reputation has worked both ways for US Optics as it has allowed them to build custom made scopes to order, unlike the big shops, but it has also given them a reputation of building scopes out of their garage. If you read our industry visit article about US Optics, then you know that this is all about to change as the company was purchased in 2017 and is now in the process of redefining itself with a new state of the art facility. 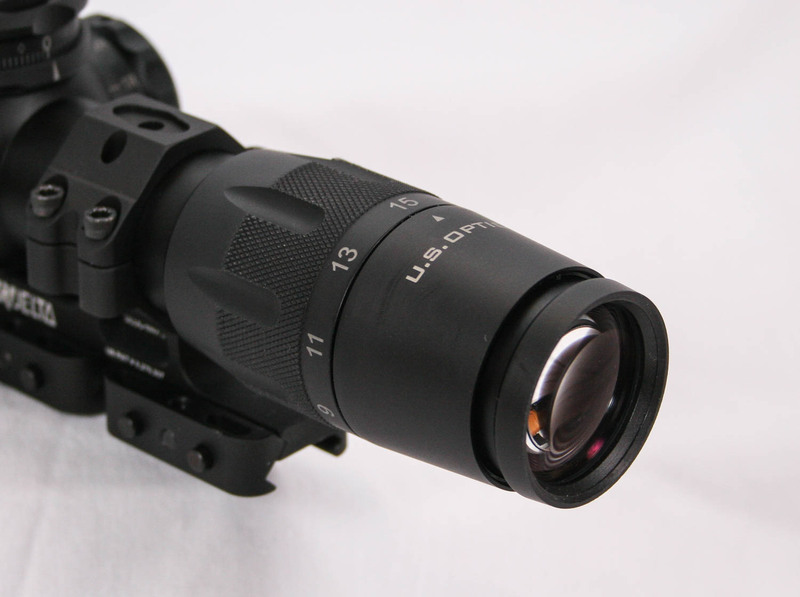 A big part of this new era of US Optics was the introduction of the B series of scopes. 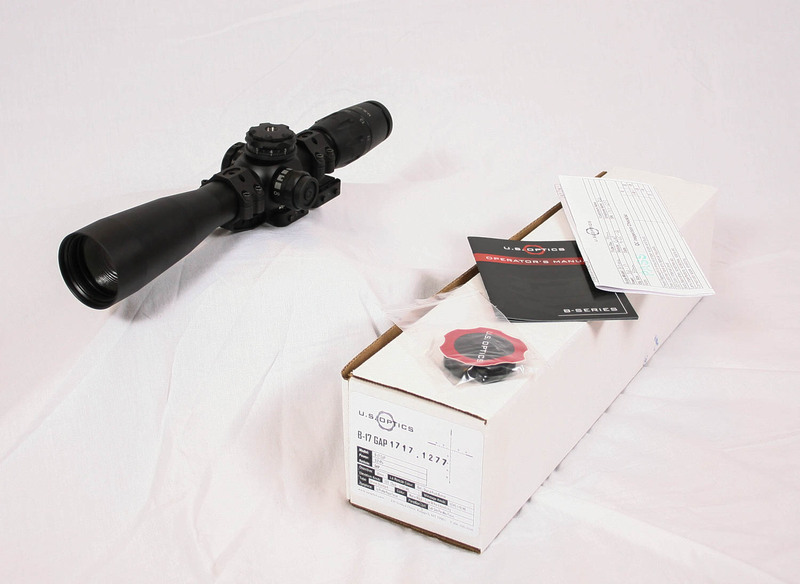 We wanted to see just how far they have come, to do that we brought in a B-17 3.2-17x44mm scope for a detailed review. The B-17 we are reviewing here has MIL knobs and GAP reticle. The scope arrives in a very basic white cardboard box, but as many readers know, we prefer this as the quality of the scope seems to be inversely proportional to how much they spend on the box! While this is not always true and is just a humorous conjecture, it sure seems that the higher end scopes come in very basic boxes. Inside this basic box there is an inspection quality control card, small instruction manual, and a tool for adjusting the EREK knob and an Allen wrench for the windage knob. It is everything you need, and not much else. The eyepiece housing on the B-17 is larger than a normal eyepiece, and it has a unique shape to it. Instead of the eyepiece being a uniform diameter it instead has a taper to it, getting more narrow as it moves toward the rear. There is a fast focus eyepiece that covers the entire diopter range in about 1.3 rotations. There is no rubber ring on the eyepiece to help cushion a blow in case if there is a scope kiss during recoil and with the eye relief at only 3.2″, there is a bit higher possibility of that happening. We typically like to see 3.5″+ for a high powered long range rifle system, but the B-17 is still likely workable on most rifles, just be aware. 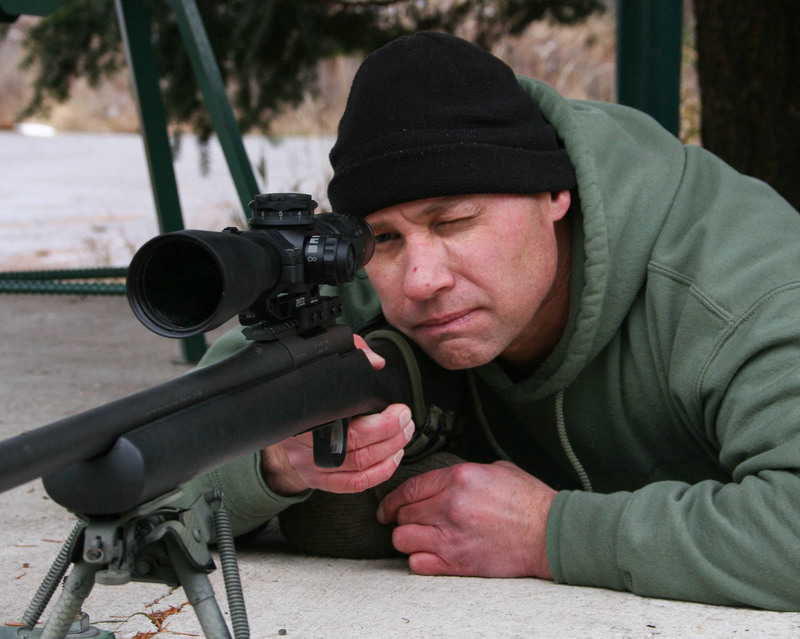 We didn’t have any issues on our fairly light recoiling .308 test rifle. At the front of the eyepiece, and taking about about half of its length, is the zoom power ring. The subdued numbers that indicate the zoom power are on a flat portion of the ring and are a bit hard to see from behind the scope, but since the reticle is in the first focal plane, the zoom setting is not critical. The ring and eyepiece housing are large, as we indicated, and there is some shallow knurling on the ring to help with grip, but the checkering on that power ring helps even more. The force required to rotate the ring is not high and is very smooth through the entire range. A thumb lever would be nice, but the way it is works well enough. 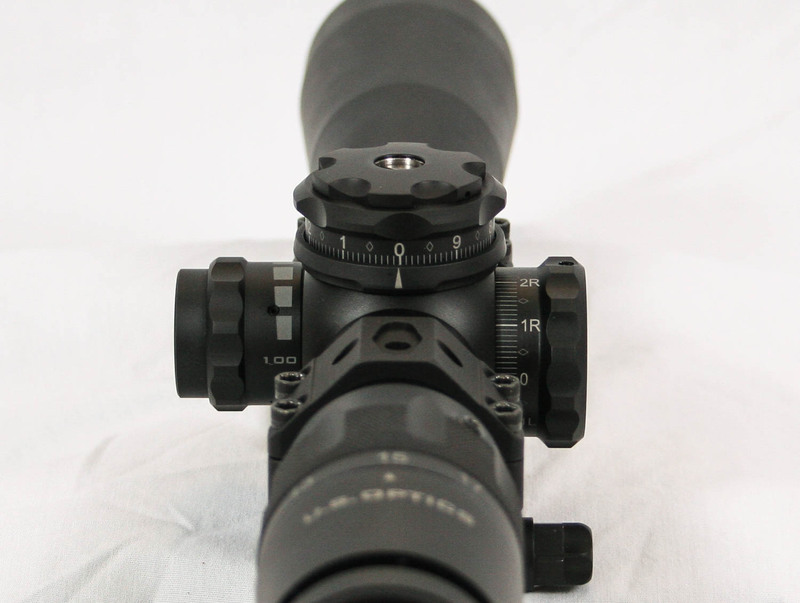 The tube diameter is 34mm and there is a relatively short 1.9″ of space on the rear tube between the eyepiece and shoulder of the scope in which to mount the rear scope ring. With modern one piece scope mounting rails, this is usually not a problem, but do be aware that it is not a lot of space before the shoulder begins. The shoulder shape itself is rounded with a wide flat top where the large diameter, low profile, knobs are located. One of the pioneering things that US Optics introduce years ago was their EREK knob which stands for Erector Repositioning Elevation Knob (EREK). 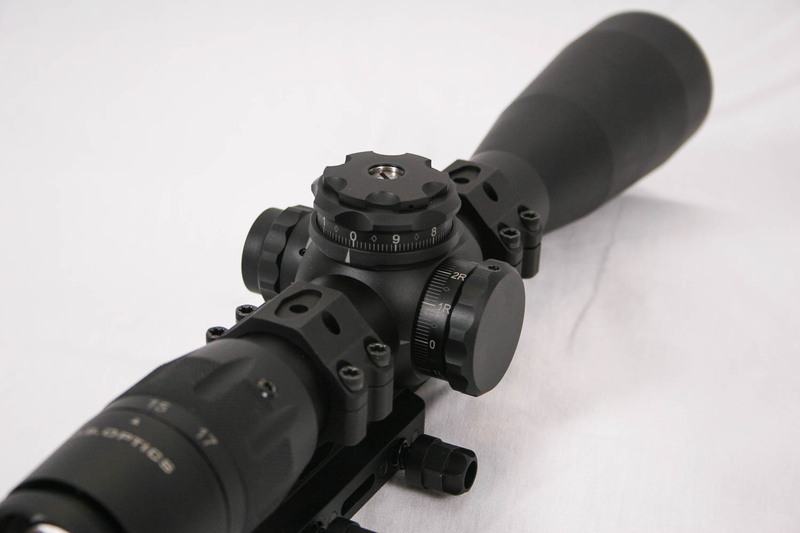 This setup uses a center screw in the knob to do the rough zeroing allowing the knob to be set to the bottom end of the elevation range, giving the scope most of the elevation adjustment to be used for up adjustments. The B series of scopes utilize this same EREK knob and it comes from the factory adjusted down about 20 MOA from center. The shape of the EREK elevation knob is a very wide diameter and low profile design that gives 10 full MIL of adjustment per revolution. The individual clicks are very positive with no slop at all between them. They require a decent amount of force for each click, but if you still run into an issue of the knob inadvertently moving, there is also a lock feature. At the bottom of the EREK knob, there is a ring that can be pulled up, locking the elevation turret in place until it is pushed back down. It is simple and works well and for the most part stays out of the way until needed. 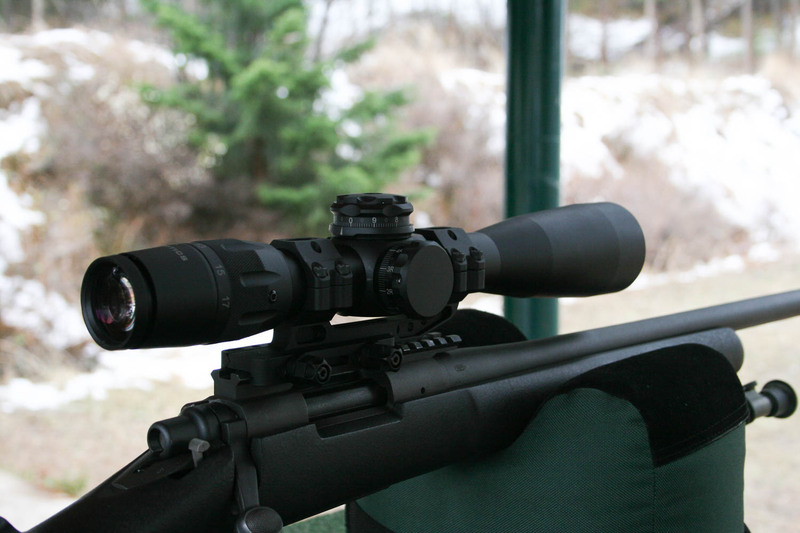 The elevation knob is intended to be slipped without the use of tools once the scope is zeroed. The spin knob at the very top of the EREK is intended to be loosened using the palm of your hand, but sometimes it might be tight, and the provided hard plastic tool helps with getting enough grip to loosen it. US Optics indicates that the B-17 has 24 MIL of elevation adjustment and with the ability of the EREK to be adjusted to make use of almost all of that, this allows for a lot of elevation adjustment for long range engagements. The knob also features a zerostop feature (called EK2) which is handy as there is no second row of markings on the knob. The markings on the elevation knob are easy to read with a number at each full MIL mark as well as individual hashes for each click. There is a diamond at each half MIL which we found made a very nice visual reference that was quick and easy. Additionally, US Optics offers BDC marked knobs for the EREK as well. There are a lot of features on the elevation knob, but the windage knob is fairly straight forward and basic. It is a different size and shape, but still has good positive clicks. It counts up in both directions, a nice features, and overlaps at 5 MIL, which is enough for 10 MPH crosswinds with a 308 well past 1200 yards. The windage knob also has a lock feature, but it is different than the elevation knob. You simply press the entire knob in toward the tube and it snaps down, locking it in place. It is a bit odd having a different locking control than the elevation knob, but it should not be too difficult to master. On the opposite side of the scope from the windage knob is the adjustable objective combined with the illuminated reticle control. The adjustable objective control knob is easy to operate due to some larger diameter knurling that makes it easy to grab and rotate. The control is smooth through the entire range and requires just about the right amount of force to move. On the end of the knob is a push button control for the illumination control. Press it once and the illumination is at a very low night vision appropriate level. Press the button again and it goes to the next higher brightness level. There are 10 levels of brightness, with the last three being too bright for anytime except a bright lit day. But there are enough levels to suit all conditions. If you hold the button for 4 seconds it will turn it off. The illumination control works fine, but there is no easy way to go directly to a particular brightness level from the off position, requiring the operator to cycle through the levels until getting to the one they want. It is not as efficient as some controls, but it is not horrible either. If the illumination is left on for 4 hours, it will automatically turn off. Additionally, the entire reticle is illuminated and not just the center portion, and the brightness level is uniform over that entire reticle. We did notice that when the scope is set on the lowest zoom level of 3.2x, there was a noticeable plum of brightness at the 3 o’clock position, which is likely where the light source originates from. It is really bad at any brightness setting above about 5, though it goes away once the zoom is at 7x or higher. 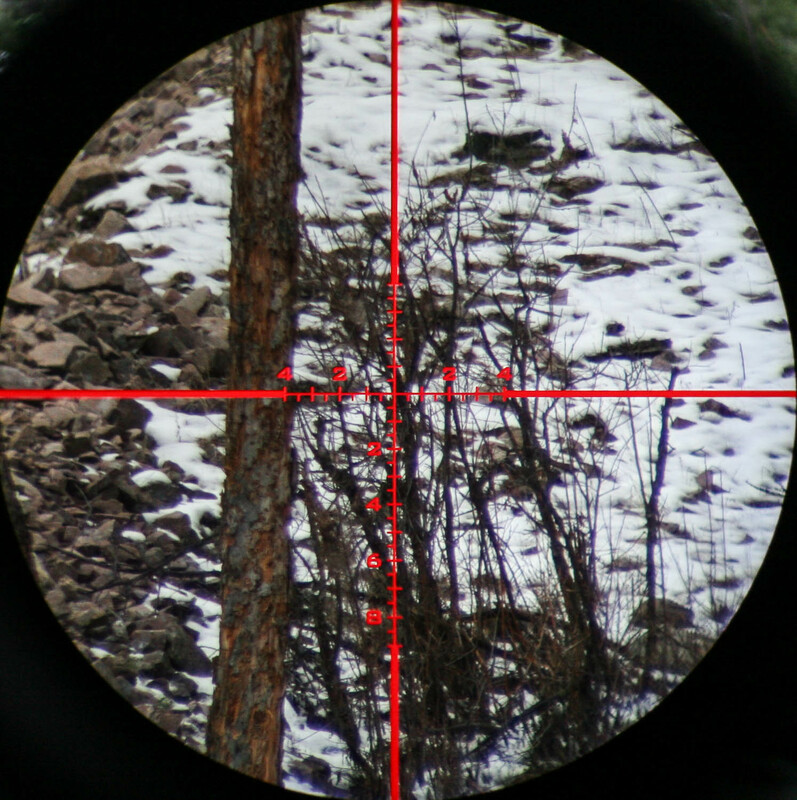 The GAP reticle is a straightforward MIL based reticle that is simple and clean. We have always liked it and found it useful and it works well on this scope. There are larger full MIL hash marks combined with hash marks that are only on one side of the stadia that represent the half MIL marks. There are numbers every two MILs to make it easy to get the measurement without having to count. The reticle extends to 4 MIL to the left, right, and up, with a full 10 MIL below the horizontal stadia. The thickness of the reticle is well done for a FFP scope that spans a large zoom spectrum like this scope. On the max 17x, it is a bit thick for super precision shooting at 100 yards, but this is a tactical scope, not a benchrest scope. The thickness is well suited for tactical environments. In front of the shoulder where the controls are located, there is another 2.1″ of tube length to use for the forward scope mounting ring and then the tube tapers up into the objective lens housing, or “Bell” as it is known. The B-17 has a little bit of a unique two step taper that is different than most and honestly, we do not know if it is purely for cosmetics, of if there is some engineering reason why it does that. The objective lens is 44mm in diameter, which is a bit smaller than most scopes with this much magnification, but does allow for mounting the scope low to a rifle. 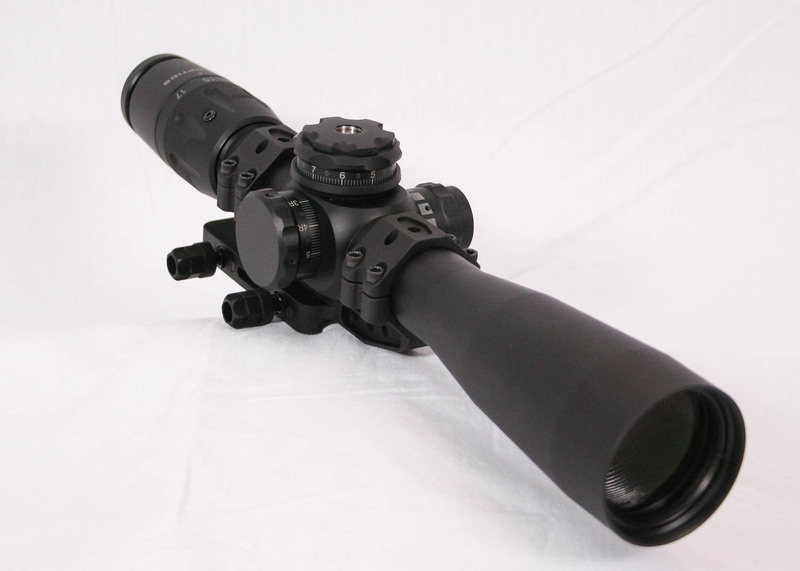 The overall shape of the scope is one that is large, but not overly large or cumbersome. It weighs in at just a tad under 2 lbs (31.1 oz) and it feels and looks solid. The overall quality seems to be high which shows with the smoothness of the controls and nice clicks as well as the quality of the finish and markings. The optics on the scope are also very nice with a good bright picture from edge to edge with good resolution and a reticle that is easy to make sharp and clear. At this point in our evaluation it was time to get the scope mounted and prepared for our practical tests on a rifle in shooting conditions. We used our normal Remington 700P test rifle chambered in .308 Win which has a 20 MOA steel Warne base attached to it. The B-17 came from US Optics already mounted into a ZroDelta single piece scope mount that attaches to a normal rail. This made mounting the scope extremely easy, taking about 10 seconds, but these setups are intended for a MSR platform and it put the scope way too high for our liking. We decided to leave it as is and continued on since it would have no impact on our testing of the scope. It was time for the range. For all of our tests, we were shooting HSM 168gr 7.62x51mm ammo which this rifle tends to love. The scope was very simple to zero and we immediately went into our battery of tests once that was done. 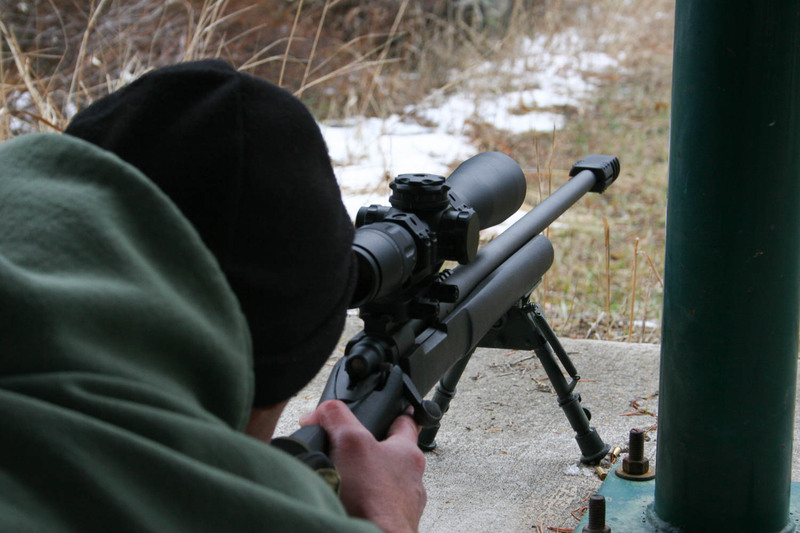 If you are not familiar with how we test our scopes, please check out the article How We Test Rifles and Scopes. First up was our box test, shooting a 2 MIL box with excellent results as the tracking appears to be very good. The last group was right on the corner of the first and then we made one last adjustment, measuring the needed changes with the reticle, and brought the scope right on zero of our aiming point. We then fired a group, which measured sub .5 MOA, and then dialed in 6 MIL of left adjustment and fired a second group, also well under .5 MOA. Then finally we dialed the 6 MIL of right back in and fired a final round that went right into the middle of the first group, showing good repeatability of the knobs. We then measured the distance between the two groups to see how accurate the clicks are in a shooting environment. The distance measured 21.8″, whereas the exact distance should have been 21.6″, a difference of only .2″ which equates to an error of 0.9%. With this test, due to the error introduced by group sizes and the targets likely not being exactly 100 yards away, we consider 5% error to be passing and anything under 3% to be excellent. Obviously, with an error of below 1% the click sizes are right on and a great result. Next up was to test the scope for any reticle drift while adjusting the zoom as well as adjustable parallax (side focus). With our boresighting grid mounted to the rifle we started first with testing the zoom to see if the reticle moved at all anywhere from 3.2x up to 17x. 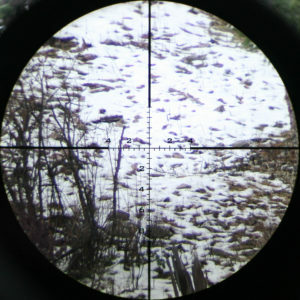 Throughout the range the reticle was rock solid and did not move as far as we could tell. When testing the focus, we did measure an up/down shift in the reticle as we traversed the entire focus spectrum. From the very closest setting, marked 50 yards, up to infinity, there was about a .2 MIL movement in the reticle. From the range of 100 on the knob to infinity, the shift was closer to .1 MIL and while it is not perfect (few scopes are) it is small enough it should not pose any problems. In our range testing we determined we really liked the spacing between the clicks on the elevation knob, but as is common on knobs that cram lots of clicks per revolution on a smaller diameter knob, the clicks on the windage knob were a little tight. We occasionally would dial in a couple clicks when we only wanted one. We also wanted to mention that there is what is called “tunneling” that occurs between 3.2x and 5x. This effect is where the entire field of view shrinks and looks like you are looking through a tunnel. US Optics is aware of this and they even address it in their FAQ on their web page. It looks weird, but they insure us that it is more desirable to have this low end tunneling in order to insure the largest field of view at the higher magnifications. Schmidt & Bender also experiences this on their PMII 5-25x56mm scope. So how does this new B-17 model stack up? Not bad. 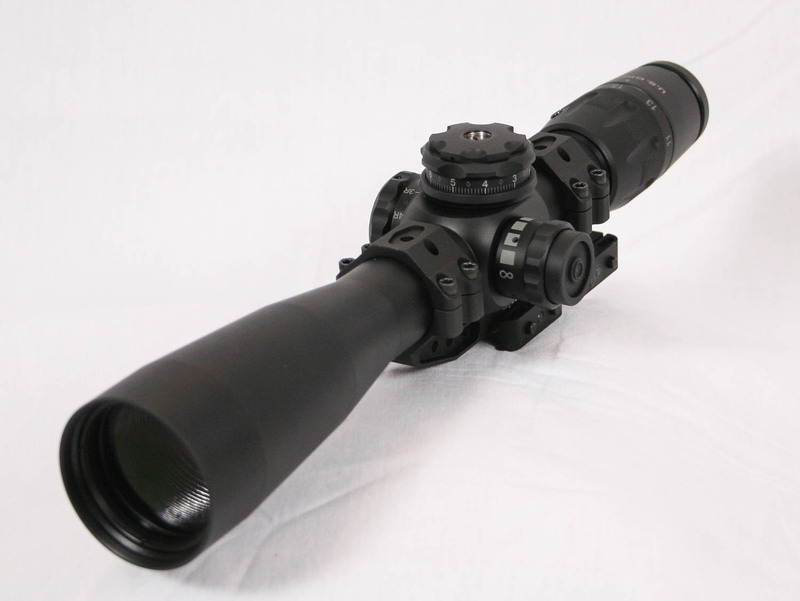 The price of the scope is getting close to $3000 USD which puts it in direct competition with some seriously good scopes from S&B, Nightforce, Vortex Razor, and even lower end Hensoldts. While we do not know if we would call it superior to those scopes, it certainly can be considered a good competitor. The tracking is excellent, the design is a bit different, and there EREK knob with EK2 zero stop is another good feature. The quality is very good and after having visited the factory in person, we are confident that they are turning out a good american made product that they are willing to stand behind. Of course, there are things we would like to see improved such as no shift in their reticle when adjusting the focus, a little bigger click spacing on their windage knob, and perhaps changing the zoom from 3.2x on the lower end up to 5x for a 5-17x scope, thereby getting rid of the tunneling. But overall, we like the scope and the indicators of things to come from US Optics. The B-17 is a very solid option and should function very well on any tactical rifle. I also need advice for my rifle, particularly the scope. One guy recommended this one to me: https://www.atncorp.com/thermal-scope-thor-hd Do you know anything about it? Have you seen any reviews?